The Auckland Museum, one of New Zealand’s most popular tourist attractions, recognized the need to modernize the museum entrance’s static information display with a more dynamic, multi-monitor approach. The cost-effective system showcases high-resolution images and video. The Auckland Museum, considered one of New Zealand’s finest heritage buildings, attracting over a half-million visitors annually, was interested in upgrading the museum entrance’s printed poster designs with a dynamic digital technology to promote current and upcoming exhibitions and galleries. 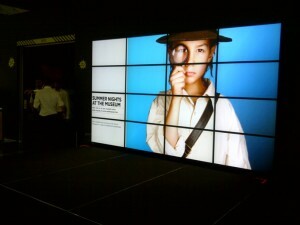 The required display solution had to be large enough to captivate audiences in the high-traffic area and the museum’s staff readily acknowledged that it should serve as an ideal, all-purpose electronic canvas to meet their digital display needs. 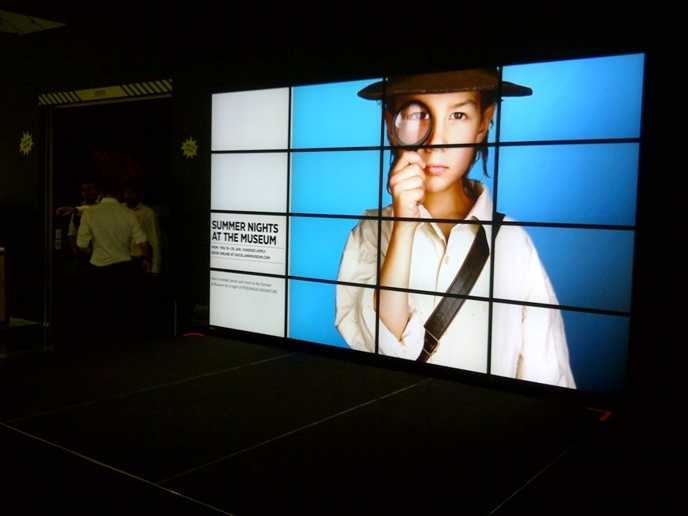 The museum already determined that the new installation be prominently featured at the entrance area and there was plenty of wall area for Wallflower to confidently recommend a large display-sized format in the form of a 4×4, 16-monitor video wall. To complement the Matrox M9188 boards, Wallflower integrated their proprietary Wallflower Lite content-management software. The software allows system operators to intuitively manage their in-house designed multimedia, including information playlists to be run at specific times and dates. More importantly, video sync was achieved via the Wallflower software—without any DirectX support—so high-resolution content can be displayed across all monitors at a total resolution of 7680×4320. The state-of-the-art, 12×7 foot video wall now serves as the official welcome banner in the museum’s main entrance, instantly engaging, informing, and even entertaining visitors with crisp, clear, and dynamic content. The staff has embraced the easy-to-use digital signage solution while positively noting the tremendous stopping power it has over passers-by. Matrox Graphics is a leading manufacturer of graphics solutions for the ProAV and digital signage markets, offering a comprehensive product line including TripleHead2Go external multi-monitor adapters, Maevex video distribution over IP solutions, and Mura MPX video wall controller boards. Matrox hardware solutions allow professional AV installers and system integrators to confidently meet the most demanding multi-monitor requirements for any digital signage installation. *Stretched desktop across two M9188 cards is available only under Microsoft XP and Windows 7 XDDM mode.